At Desert Hope, we understand that recovery from a substance use disorder doesn’t happen overnight, and that it may be difficult to adjust to a healthier, sober lifestyle after treatment. Aftercare, also known as continuing care, can help you stay on track with recovery during the first year after treatment and beyond. Do You Provide Aftercare Plans? Following treatment at one or more levels of care, you will reintegrate back into the community and resume work and family life. Desert Hope helps you plan and prepare for aftercare from the very start so that you lessen your risk of relapsing back to substance abuse when you are back in your home environment. Before you leave Desert Hope, we will help you develop an aftercare plan that involves continued participation in support groups and therapy. We’ll also discuss the possibility of your continuing treatment at our nearby Desert Hope Outpatient Center. 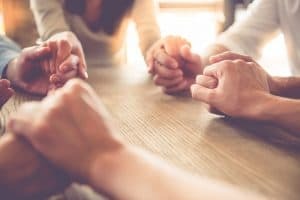 Aftercare may include steps such as attending individual therapy, continuing or initiating medication management, and attending community-based support groups like Alcoholics Anonymous and Narcotics Anonymous. It might also involve transitioning into a sober living home to reintegrate back into society while also living with a sober support network. Your case manager can stay connected with you after you leave Desert Hope to check in with you, see how your aftercare is going, and provide you with resources to help you maintain abstinence from drugs and alcohol. How Can I Stay Connected to Support? Maintaining connections with people who are strongly invested in your recovery minimizes your risk for relapse. Substance use disorders are often accompanied by feelings of isolation, which is why it can be critical to connect with others who understand your struggles and who want to see you succeed. Being part of a recovery community gives you a sense of inclusion and belonging, as well as a sense of purpose. The Desert Hope team strongly encourages patients leaving treatment to attend recovery groups such as AA or NA on a regular basis to continue receiving support regularly, share your journey with your peers, and help others (which can provide meaning and keep you motivated). Don't just dream about a new life. Live it. Ready to change your life? Our caring Admissions Navigators are waiting for your call right now.